Côr Godre’r Aran is based in the village of Llanuwchllyn (Church above the lake) at the western end of Llyn Tegid (Lake Bala) in the old county of Merioneth, North Wales. It is an area which has retained its firm Welsh identity in a modern and vibrant Wales. The Aran Mountains form a majestic backdrop to the scenic view looking west from the rural market town of Bala located at the eastern end of the lake. The area is steeped in history and has a long and proud poetic, literary, musical and cultural heritage. 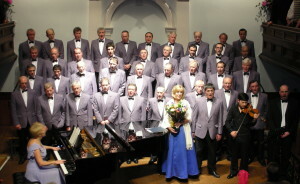 The choir membership represents a spectrum of rural occupations and is unique in that all members are natural Welsh speakers. Since its inception the Choir has regularly entertained audiences all over Wales and at many principal venues in England including The Royal Albert Hall, The Globe Theatre, The Sage and Birmingham Symphony Hall. Concert tours have taken them to Scotland, Ireland and Portugal and extended international tours include three visits to Canada / U.S.A., and eight tours of Australia with visits to New Zealand, Tasmania, Hong Kong and Singapore. After 30 years a return visit was made in November 2007 to Patagonia, Argentina, where a strong community of Welsh descent still thrives. Over the years Côr Godre’r Aran has successfully competed at National and International levels and won principal awards at the National Eisteddfod of Wales and four male voice chamionships at the International Eisteddfod at Llangollen. 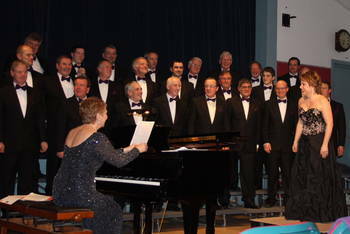 In 2005 the Choir won the BBC Radio Cymru competition for Male Voice Choirs.